Interested in becoming and Editor-at-large? Sign up! 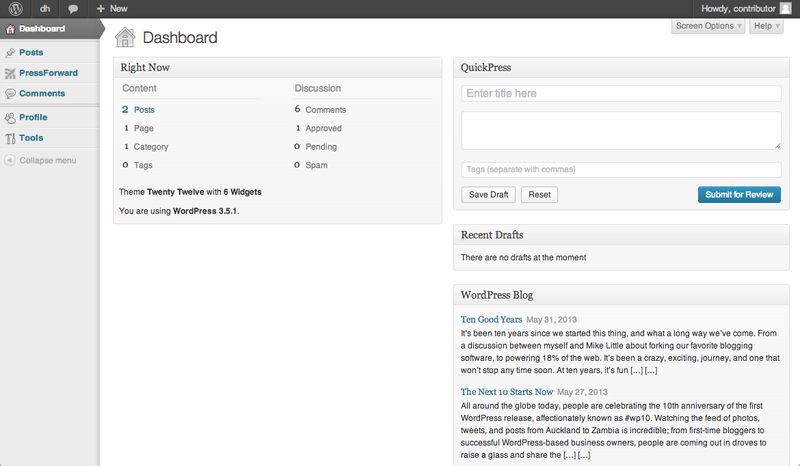 We use the PressForward plugin to combine the feeds in one place for you to review. These instructions will walk you through the process of logging in to your dh+lib account and explain how to nominate content. Guidelines for reviewing and evaluating the content are provided after technical set-up. We encourage you to login to your account as soon as possible in order to make sure everything works and that we have time to process your nominations in time for the Thursday morning publication deadline. PressForward will provide you with some current, relevant candidates for inclusion in the review, but we are also hopeful that you will bring your own experience and expertise to the table–if, during the course of the week, you come across items that are not showing up in PressForward, we encourage you to email them directly to the editors at dhandlib.acrl@gmail.com. Just put “nomination” in the subject line and send us a link! You will find the Reader in the “PressForward” tab along the left hand side of the screen. Clicking either “PressForward” or “All Content” in the menu that appears will open the reader for you. There are two main ways to read the items in the reader. The default view is a “snippet” view, where you can see the title, author, and the first 100 characters of each post. As you scroll down the page, additional items will load. You can also switch to a “list” layout, similar to what existed in Google Reader, by selecting “list” from the horizontal navigation above the feed items. From here you can navigate between articles, add a comment for the editors, star items to return to later, and nominate items for publication. If you want to go back to the initial view, use the “X” in the top right corner or the “close” button in the bottom right corner. The star is a user-specific feature that enables you to mark particular items that you would like to return to or find interesting, but have not determined if worthy of nomination. The conversation box enables you to leave a comment when nominating a piece. You might specify what category you see the item included in (Recommended, Post, Resource, etc.) or provide rationale or context for your nomination. The number appearing to the left of the box refers to the number of comments that have been made on the post. 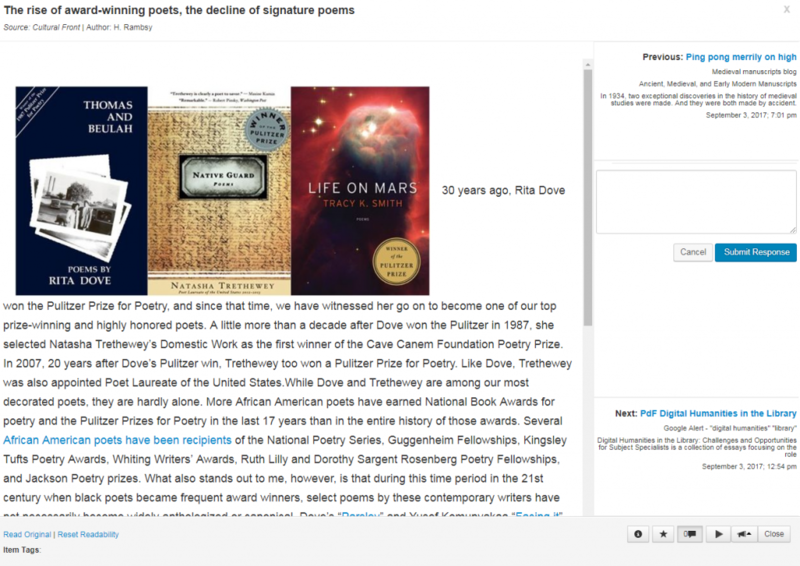 Select the SINGLE arrow to nominate the piece for publication in dh+lib. If the double arrow is green, then the piece has been successfully nominated for publication. If it appears for you, please DO NOT Click the DOUBLE arrow, which does not nominate the piece but creates a new post about it. The Review Editor for the week will use the nominations to create posts later. We do not use the Amplify feature (the Bullhorn). You can nominate content in any of the available views. We also strongly encourage you to also draw on your own knowledge of the field to nominate content that we may have missed by emailing the link to dhandlib.acrl@gmail.com. Evaluating Items: What Should I Look For? These are indispensable pieces, often a blog post or article, that will be most helpful to the dh+lib community. These pieces will offer original ideas and provide a critical analysis of the broader field of digital humanities or the role of libraries, archives, or museums in digital humanities work. Similarly, we are also looking for works of digital humanities scholarship – research that applies digital methodologies to questions in the humanities or applies critical methodologies to the relationship between the humanities and digital technology – with some consideration of libraries, archives, or museums. We are interested in featuring new digital projects, both projects that focus on particular research questions and projects that bring particular collections into the digital space. These are blog posts that offer a timely analysis of current conversations. They might not fit in the Recommended category but are worth sharing with the dh+lib community. 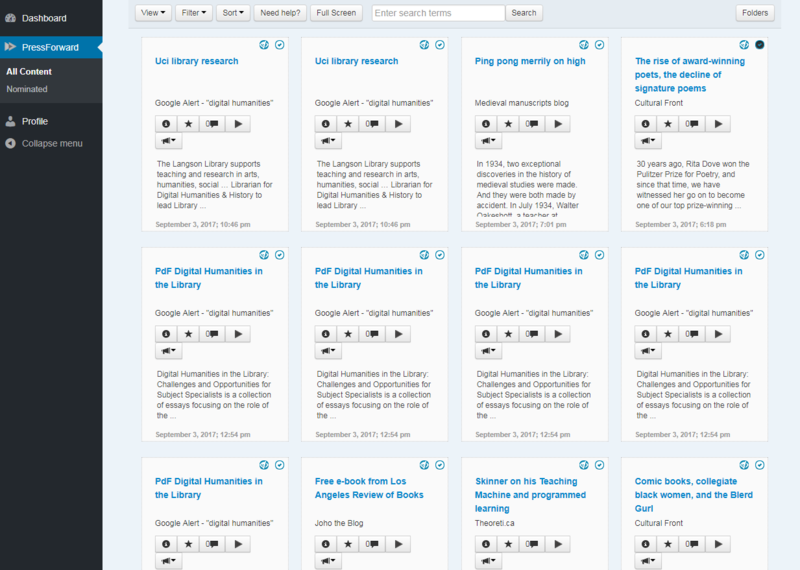 This include items such as reports, white papers, conference presentations, and lectures as well as tutorials, tools for digital research, and sources for further information on a topic within the digital humanities. Our preference is to link to items all of our audience will be able to access, and in the case of journal articles, to articles published in Open Access journals or those whose full text is available in open repositories. We interpret “CFP” quite broadly, including calls for participation, calls for projects, and requests for feedback, in addition to more traditional calls for papers. For items that are outside the scope of jobs or CFPs but that offer either learning opportunities or monetary support for digital humanities work. We are looking for work opportunities that are specifically focused on both digital humanities and libraries. Positions might be postdocs, alt-ac or tenure track, and will likely be situated in libraries, archives, museums, or galleries. We tend not to feature unpaid internships or positions that do not appear to fall within the field of librarianship. If you have additional questions or run into difficulty during setup, don’t hesitate to contact us at dhandlib.acrl@gmail.com. Additionally, we encourage you to draw on your own knowledge of the field to nominate content that we may have missed by emailing the link to dhandlib.acrl@gmail.com. You may also suggest feeds to be added to the list of those appearing in PressForward using this form. Editors-at-large are responsible are responsible for reviewing the pieces produced and shared by the dh+lib community and nominating the most important scholarly work and news items for broader distribution through the dh+lib site. The dh+lib Review editors (Caitlin Christian-Lamb, Roxanne Shirazi, and Patrick Williams) rotate through week-long shifts, and review each of the nominations from the editors-at-large. The primary factor in determining which pieces are featured is the number of nominations – e.g. a piece that was nominated by three editors-at-large is more likely to be selected than a piece that was nominated by one editor-at-large. The editors uphold a commitment to ensuring a diversity of opinions are represented in the dh+lib Review. Selections are also based on a piece’s fit within the categories mentioned above, as well as a piece’s quality, relevance, originality, and timeliness. Don’t hesitate to contact the editors at dhandlib.acrl@gmail.com if you have any questions about the nomination or selection process. If we have featured your content on our site and you would like it removed, or if you would like for your website’s RSS feed to be removed from the dh+lib RSS feed, please contact us at dhandlib.acrl@gmail.com. We would like to extend our gratitude to the Editors of Digital Humanities Now and PressForward — Digital Humanities Now was the inspiration for this project and we appreciate their ongoing guidance and encouragement in helping us get started and for sharing their workflow materials. We would also like to thank PressForward for sharing their titular WordPress plugin, and especial thanks to the developers, Aram Zucker-Scharff, Boone B Gorges, and Jeremy Boggs.